astreeemly cute picture!!! candidate for kitty calendar? oh, that's a great box. efurryone has boxes and we doesn't. MOOOOMMMM, stop frowing out the boxes! Heh...we have boxes like that. Sometimes, we pounce on a People from them! Wow, yer eye luks vary cute in that box. What a grate picktur yer lady captured. We gotted a good box this weekend.The humans got a new pottie for their grooming room and we got the box...but only for a day. Oooooo, you are very sneaky!! Oh Beau Beau yu's is sooooooooo cute in dat box,can I comes ofur and play in it wif yu? There is no way the humans can see you in there! That's a great box to hide in. They must have set up a hidden camera to get that photo of you. Oh Beau you are such a cutie. Angie will not know what hit her. Have fun. 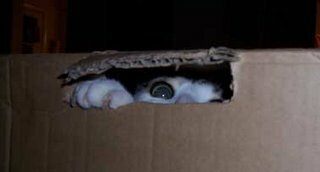 hmmm...normally i'm all about the hidin' an the pouncin' an i shure duz love a good box, but don't pounce on purrty Angie! pounce yur peoples instead. i don't fink purrty Angie wants ta be pounced. maybe i come offur an you an i plays pounce an then i cuddle wif Angie? Beau Beau, I fink I sees you. I gotta poke a paw in to check, tho. Hey, know what? We just posted sum "where's Victor" pictors on our blog. Come see if you can find me! That's a way cool box, Beau Beau! fury nice box. boxes are the bestest. Woo hoo!!!! Great box, great Cat, great shot. HeeHee! Beau Beau, you are my kinda pal. I do this to my sisters all the time!! haha!! SO funny and cute! Love it! !